Our clients can avail from us Fiberglass Cornice Mould, which is also known as cornice molding. At the junctions of walls and ceilings, these molding provide a clean and continuous line. Detailed Product Description Fiberglass Cornice Mould. One 20GP can load 750 pcs of fibre glass mold. It is made with the standar of the line.Ang it does not get distored and shinked after used for a longtime. 3.it doesn’t get distorted and shrink after using a long time. 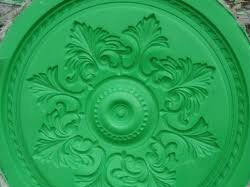 Glassfibre Reinforced plastic moulds for Gypsum cornice making Nowadays, the world has entered an environmental epoch. It is no doubt that the gypsum products have taken the place of other decorative materials for the exploding market demand. To satisfy the different customer requirements and create a clear and green home for you, we will continue to research and develop more & quality GRG moulds. Our GRG moulds are produced by selected superior UPR (unsaturated polyester), reinforced with the steel frame at the backside, and finely carved by the OTR-3TDSCAN.It is smooth in the surface, strength in third dimention with clear flower pattern. Meantime, it doesn’t get distorted and shrink after using a long time. The mould drawings from customers are also warmly welcomed. Materials: The Glassfibre Reinforced plastic moulds is made by glass fibre , resin and steel frame.